Make sure to check out the video at the bottom and the link to see the rest of my photos! If you missed the photo galleries from my other posts you can go to the Photos page in the menu and access the links. 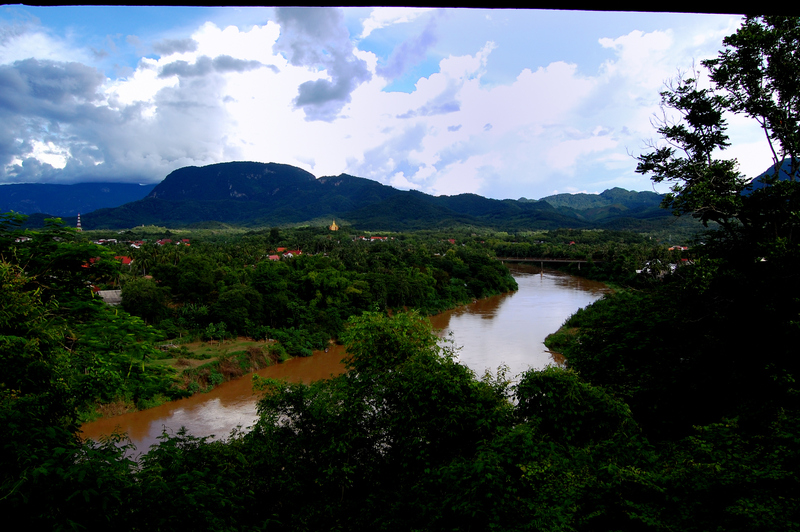 I spent eight lethargic days in Luang Prabang, Laos. On every block I found a French coffee shop to sip espresso, read a book and watch the orange-robed monks stroll. During the steamy afternoons I napped on the guesthouse porch while my Italian friend Javi strummed his guitar. I’m not a relaxed person. My mind never quiets. I’m constantly thinking, wondering, stressing, and battling anxiety. Over the years I’ve learned to control my wandering mind, but I’ll always be a thinker and an analyzer. I’m drawn to naturally relaxed people because I lack that trait. So when Javi said he booked an hour massage I indulged in the relaxation and handed over my $4 with an urge to be pampered. Really? This is what I’m analyzing while someone is cracking my back? For centuries religion has sparked conflict all over the world and I’m wondering why during my massage. I don’t identify with one religion. My parents raised me Catholic but I never go to church. An indication of my religious confusion is the necklace I wear everyday while traveling. A silver chain with a Catholic St. Peter’s cross and a Cuban Santeria asavache hangs on my neck to keep me safe. I figure either I’m doubly protected or they cancel each other out and I’m back where I started. I’m not saying I don’t believe. I pray. I believe that people enter our lives for a reason. So, to a certain degree I believe in fate. I believe that we don’t have full control. But under what religion does that classify me? My trip to Asia is the first time I’ve traveled to countries not predominately Christian. It’s an eye-opening experience. Monks pass me on the street and I wonder where they get their devotion? Some are as young as 10 and others are 50+. In Laos it’s very common for most men to spend at least some time as a monk, so maybe it’s a cultural construct? But really every religion has followers who dedicate their entire lives to its practice. So where does that calling come from? And why do some of us not feel it? I know this is a touchy subject. But if believing in something is the central idea, why does religion ignite conflict? With all the temples scattered through this city, it seems like an ideal place to devote your life to worship. Lao Buddhist followers never experienced the violence that ensued in nearby countries like Burma, but apparently some tension exists between the Lao government and Buddhist community. Government officials tape the sermons of clergymen to ensure that they adhere to Communist doctrine. Several years ago the government also cut the monks’ food rations. Some people criticize the Lao clergy for adhering to the government’s political aims. So even though the monks appear to lead a peaceful existence, I question if they feel they can really adhere to their religious beliefs? I think the general idea that no religion is free from conflict is what deters me from committing myself to one. I smile at the idea and think: if a traveler’s religion existed this would be its central precept. I commit it to memory and revert to it when I feel lonely. Maybe one day I’ll be drawn to a specific religious group, but for this journey I think I’m sticking to a general faith in humanity, enjoying the monks pass me by, and working on quieting my busy brain. CLIPS FROM LAOS – featuring Lao monks, the delicious street food I ate every night for less than $1, Mae Makang the elephant eating her bananas, my best friend in Laos (a 4 year old named Hai), and of course yours truly :). So….. after every post i want to leave a comment….i try to think of something very interesting and exciting to say, (so i won’t be repeating the same, “omg, lauren, this looks so beautiful, i wish i were there with you!!!! comment), after all, we have 6 months to go! So i sit in front of the screen, after reading and digesting and watching the video and looking at the photos, staring, thinking……….and realize, there is NOTHING interesting or exciting that i can write….because YOU ARE THE ONE DOING THE FABULOUS, INTERESTING AND EXCITING ADVENTURE!!!! I’m still here in NJ!!!!!!!!!!!!!!!!!!!!!!!!! so instead, maybe i’ll just ask questions that will teach me about the cultures you are visiting…here’s the one that stand out after your Laos trip (besides, OMG, Lauren, aren’t you getting a massage EVERY DAY!! )….what is the monk phenomenon? why do they become them? are they chosen? are you considered a life-long religious person? and….why can’t women be monks? Yay I love the question idea! And it made me do more research, which is always good. So here we go…. For males, entering a Buddhist monastery is seen as their rite of passage. But for females no public event like this exists (their rite of passage is marriage and childbirth…typical). BUT women are actually very highly revered in Lao culture and receive equal treatment in many social settings. Anyway so the rite of passage for the males as a monk usually lasts 1 month to a year unless they decide to commit their lives to the practice. Pretty much every Lao male is a monk at one point in his life. Young men who stay longer than a year are usually there to be educated because their poor families can’t afford schooling. Some do commit their entire lives, but it’s more common just to spend some time there. Actually women monks do exist. A bhikkhuni is an ordained female Buddhist monk. A male monk is called bhikkhu. 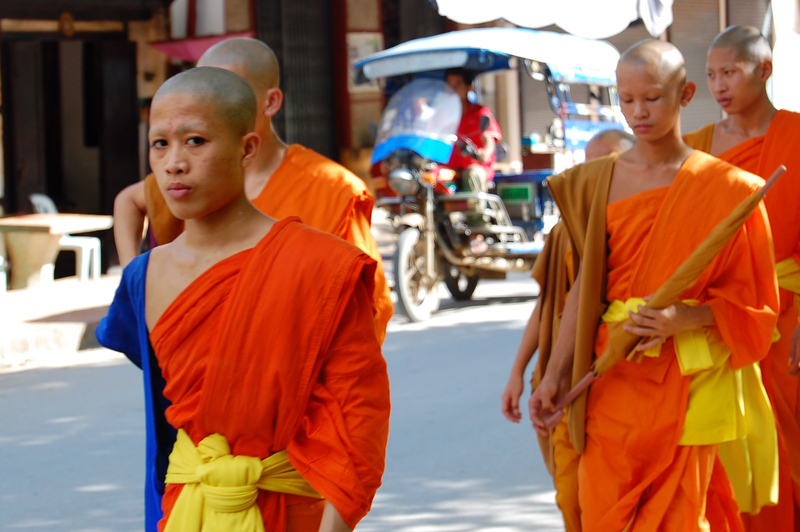 Traditional appearance of bhikkhunis in Theravadan Buddhism (what is practiced in Laos) includes a shaved head and eyebrows and saffron or dark brown robes. However in many countries women are barred from becoming ordained. So you rarely see them, and I didn’t see one in Laos. Some women continue to practice as mae jis, semi-ordained. And in 2007 there was a congress held to discuss the reintegration of women into the international Buddhist clergy, so we may see a shift in upcoming generations. 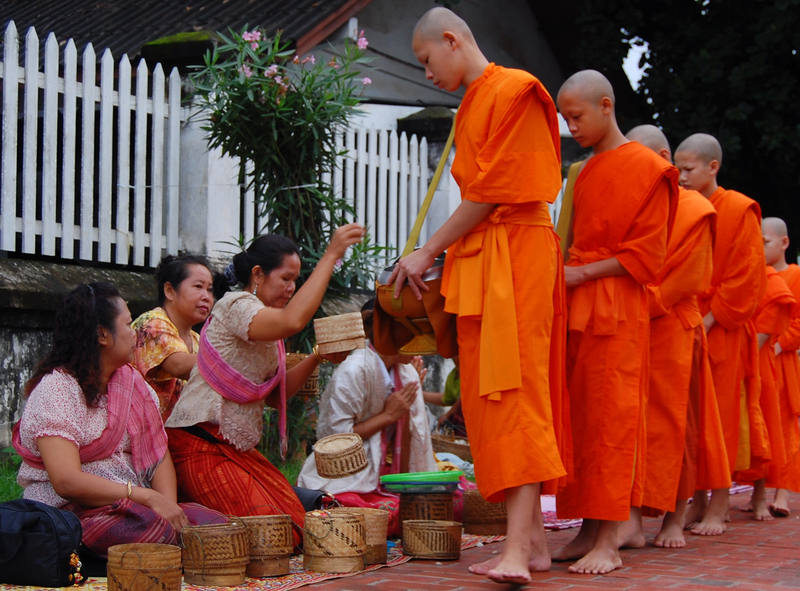 I asked around about the alms ceremony because only women were kneeling before the monks to give alms (and of course, I was annoyed that all the women were bowing before all the men!). But apparently both men and women are allowed to participate, and for some reason I only saw women giving alms for 7 days straight…..makes me wonder…. An interesting side note though from Tibet’s Buddhist Dalai Lama…he praises the involvement and integration of women into Buddhism and all aspects of life. He said, “Warfare has traditionally been carried out primarily by men, since they seem better physically equipped for aggressive behavior. Women, on the other hand, tend to be more caring and more sensitive to others’ discomfort and pain. Although men and women have the same potentials for aggression and warm-heartedness, they differ in which of the two more easily manifests. Thus, if the majority of world leaders were women, perhaps there would be less danger of war and more cooperation on the basis of global concern.” So, there seems to be a recurring call to empower women from prominent world leaders! Such an interesting time to be a woman in our world!!! I enjoyed this entry to your Blog! Looks Beautiful and you Happy ! Allison loved the Elephant ! I thought you might find him Inspirational…….you seem to have a bit in Common! 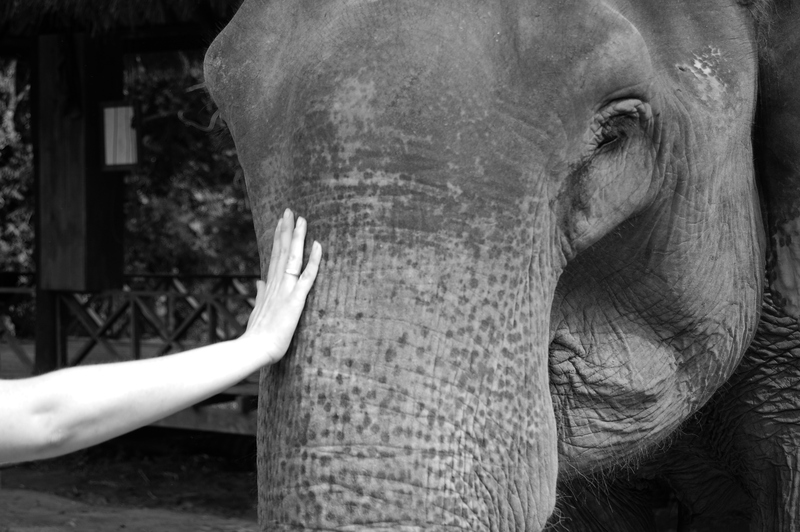 and Allison would’ve loved the elephants, I wish she had been there! As heard on NPR Yesterday they covered a story on how Austrailia has now added Indonesian Language & Studies to their Primary Education System! How lovely are the Budhist Ideals and practices!